In Romania, after the 2011 census, we have 52,000 Ukrainians out oMost of the ethnic Ukrainians in Romania represent a compact indigenous population residing in the counties along the Ukrainian border, which in medieval times were part of the Kievan Russian state and the principality of Galicia- Volâni. The name of Ukraine - which derives from Okraina (a sort of borderlands) - is of recent date because, for centuries, Ukrainians have called themselves and were called Russians, Rusyns, Ruthenians, with names coming from the Russian Kievski state formation. The name of Ukrainia arises during the Cossack state period. The links between Romanians and Ukrainians are very old, and it is worth mentioning in this context that the oldest known Ukrainian ballad is about Stefan the Great. In addition, the epic entitled "Word about Igor's army", claimed by both Russians and Ukrainians as their own, with both parties viewing it as an important old literature document for their respective nations, was discovered and made public by Moldavian boyars, who had fled to the tsarist empire. Although the relations between Romania and Ukraine were not always the best (the main bone of contention being the claim over Northern Bukovina and the southern counties of the current Republic of Moldova), political issues were largely resolved by signing a Basic Bilateral Treaty. Ukrainian presence in Romania dates back to the XIV - XV centuries, when they were based especially in the north (Maramureş and Suceava). According to some historians the presence of the Ukrainian population in these places is even older. Ukrainian settlements in northern Moldavia and Maramures, located nearby the Ukrainian ethno-linguistic massif and its extension, are the oldest in the country. Linguistic and archaeological evidence shows that an eastern Slavic population had settled these parts in the late sixth century, living alongside the indigenous Romanian population, and most of the villages still inhabited by Ukrainians nowadays are mentioned in ancient historical documents (Slavonic in Moldova and Latin-Hungarian in Maramureş) from the fourteenth century and the fifteenth century. 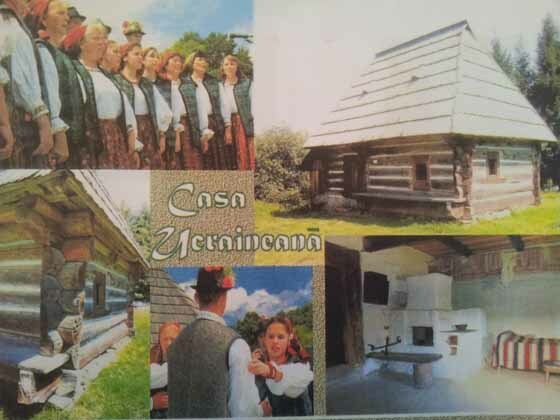 For example, in 1998 the village of Ruscova from Maramures celebrated 625 years since it was first mentioned in a document. Linguistic, cultural and spiritual identity for the Ukrainians in northern Maramures and Moldova was established and maintained by a continuous ethnic admixture from Trans-Carpathia, Galicia, Pocutia and northern Bucovina. The Hutsuls (Huţani as the Romanians call them) are those living in the mountainous area of Bucovina and the upper river valleys of the Suceava, Moldova, Moldovita and Bistrita Aurie rivers. They arrived here in the eighteenth century and found favorable conditions to practice their traditional occupations: shepherding, husbandry, forestry work, rafting; they also founded a large number of the villages and hamlets in which they still live to this day. They are called "Russians" in the old Bucovina charters. Hutsul speech is akin to the Ukrainian Carpathian and Bucovina dialects which in turn are part of the Ukrainian common language. Famous for horse breeding (they even popularized their own horse stock), the Hutsuls are also masters at making and decorating wood, leather and horn objects, at weaving and embroidery. Easter egg decoration (especially in the villages of Ulma, Brodina, Breaza, Moldovita) has brought them international fame. Ukrainian settlement in Dobrogea (the Danube Delta and the surrounding areas) is related to some of the most tragic moments in the history of Ukraine: the destruction, in 1775, of the centuries old cradle of the aspirations for freedom and independence of the Ukrainian people, Sicei Zaporojene, by Catherine II, Tsarina of Russia. To stave off retaliation, about 8,000 Zaporozhian Cossacks establish themselves in the Danube Delta, with explicit prior approval of the Ottoman Empire government. Here, at Dunavăţul de Sus, in 1813, they organize the military camp "Zadunaiska Sici", which operates for 15 years until it is abolished by the Turks. Until the second half of the nineteenth century groups of peasants from the southern regions of Ukraine flock to this realm of salvation, populated mainly by Cossacks in the beginning, to escape serfdom and military recruitment in the Czar’s army. They settle, build churches and work mainly in agriculture, fishing, hunting and husbandry. To differentiate them from their Lipovani Russian neighbors, the locals call them haholi. The Ukrainian community in Banat, located in several villages in the Lugoj, Caransebes and Arad areas, was formed mainly between 1908-1918 by colonization of areas in the south of the Austro-Hungarian Empire, which were put up for sale by their German and Hungarian owners. The Ukrainian settlers who bought plots of land came from the poor highlands of Transcarpathia, from the right hand side shores of the Tisa, and others, in smaller numbers, from the Hutsul area of Bukovina. Their exodus continued after 1918. After 1970 many Ukrainians from villages in Maramures and Bukovina bought households from the German emigrants, populating many townships which became predominantely Ukrainian (Pogăneşti, Dragomireşti, Stiuca, Remetea Mica, Barsana etc). In the last 15-20 years there has been a mass movement of Maramures Ukrainians towards Banat because they came from villages where the relief was covered with just forests and meadows and in this area they could work in agriculture. Currently, the Ukrainian community has a compact population in Northern Romania (Maramures and Satu Mare) on the border of Transcarpathia – more than 36,000 people; in Southern Bucovina in the North-East of Romania (Suceava and Botosani) on the border of Cernauti region - about 10 thousand people; in Dobrogea in the Southeast area of Romania (Tulcea and Galati) - about 1.5 thousand people. Otherwise, ethnic Ukrainians are dispersed throughout the Romanian territory. 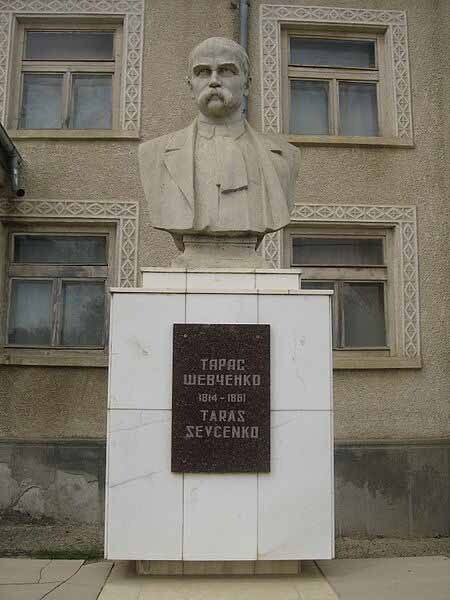 Taras Shevchenko (in Ukrainian Тарас Григорович Шевченко) (born March 9, 1814 - died March 10, 1861) was a Ukrainian romantic poet and painter, considered the national poet of Ukraine. His literary work is regarded as the foundation for the modern Ukrainian language and literature. He also wrote in Russian and created valuable works as a painter and illustrator. 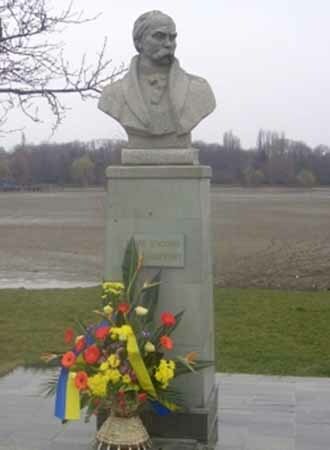 Bust of Olga Kobyleanska in Gura Humorului. Also in Maramureş County in Sighetu Marmatiei is the "Taras Shevchenko" Ukrainian High School, the only High School in Romania teaching in Ukrainian. • Folk Customs Museum from the White House Pension School (near Humor): a room dedicated to Ukrainian traditions. 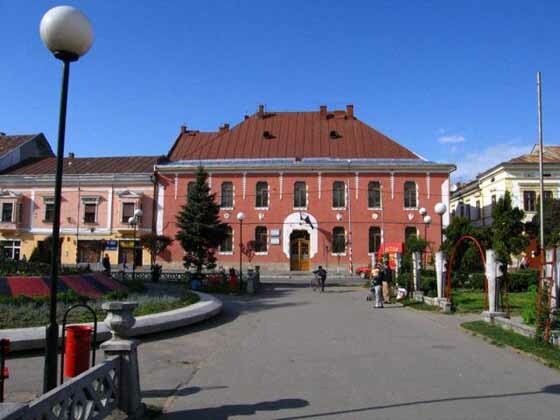 • Satu Mare County Museum: a room dedicated to Ukrainian traditions. The information needs of ethnic Ukrainians in Romania are satisfied by a weekly show on radio Iaşi (15 minutes weekly), radio Sighetu Marmatiei (50 minutes weekly) and radio Timisoara (1 hour weekly). TV broadcasts in Ukrainian are absent. TVR-2 has a show called “Together toward Europe “in which the life of the Ukrainian community from Romania is regularly presented. The Romanian Union of Ukrainians issues 4 small circulation newspapers: "Vilne Slovo", "Ucrainskii visnik", "Nas holos" and the children’s magazine "Dzvinociok" (in Ukrainian) and the "Ukrainian Courier" (in Romanian), which appear once a month and are spread throughout the ethnic Ukrainian community with the aid of RUU county chapters. In Romania there is only one school teaching in the Ukrainian language - T.Şevcenko.Ukrainian High School of Sighetu Marmatiei. In some Romanian schools from areas with a compact Ukrainian population, Ukrainian language and literature is part of the curriculum. Ukrainians from Romania can get a Philology degree in Ukrainian at the Universities of Bucharest, Cluj and Suceava which have Ukrainian sections within their Philology Departments. Education in the Ukrainian language in Romania has a fairly long history. Following the 1948 reform of public education, in areas where Ukrainians made up the majority of the population, primary and secondary schooling in the community’s mother tongue became mandatory. Secondary schools were opened in Siret, Sighet, Tulcea and in 1954 in Suceava. 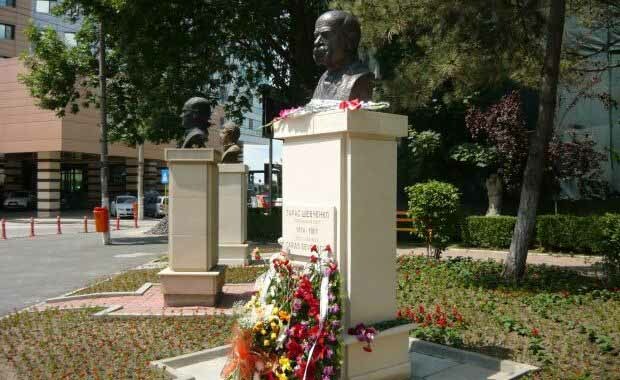 Two Pedagogical Schools with a 4 year course were founded in Siret and Sighet and the Ukrainian language and literature department at the Philology College in Bucharest came into being. In 1956 about 8825 students were being taught in Ukrainian. After a mere decade and a half, Ukrainian schools were turned into Romanian teaching schools, with only a few of them having Ukrainian as an optional subject. After 1990, education in the Ukrainian language saw a revival, starting with teacher training for kindergartens and pedagogical schools in three Romanian cities: Sighetu Marmaţiei, Suceava and Tulcea. In some schools in Maramures classes and groups with maternal language curriculum became available, and in 1997 the "Taras Shevchenko" bilingual High School was reestablished in Sighetu Marmatiei. Also, within the "Mihai Eminescu" Pedagogical High School from Suceava, special classes were set up to prepare future teachers for the schools in the rural Ukrainian areas. Currently there are 63 primary schools attended by 7360 children where the Ukrainian language is studied as a mother tongue. Besides the Ukrainian language departments at the universities of Bucharest and Iasi, two such departments have been recently established at the universities of Suceava and Cluj-Napoca. A large number of graduates from these departments are sent to Ukraine for study by the Romanian Union of Ukrainians. The Ukrainian minority is represented by the Romanian Union of Ukrainians (RUU), which is also the only Romanian organization recognized by the Ukrainian World Congress, the Ukrainian World Forum, the Ukrainian European Congress and the "Ukraine in the world” Association. The RUU issues 5 monthly publications: 3 newspapers (UKRAINSKIY VISNEK, VILNA SLOVO, THE UKRAINIAN COURIER) and 2 magazines (NAS HOLOS, Dzvonek (BELLFLOWER-for children)), and publishes annually over 30 books by Ukrainian poets and prose writers both in the Ukrainian and Romanian languages. THE RELIGIOUS NEEDS OF THE UKRAINIANS IN ROMANIA are represented by the Ukrainian Orthodox Vicariate, part of the Romanian Orthodox Church, with headquarters in Sighetu Marmatiei (the Vicariate was established in 1996 and it includes 25 parishes and 52,000 parishioners), and the General Ukrainian Vicariate of the Greek Catholic Church with headquarters in Suceava (the Vicariate was reestablished in 1996 and it has about 6000 parishioners).